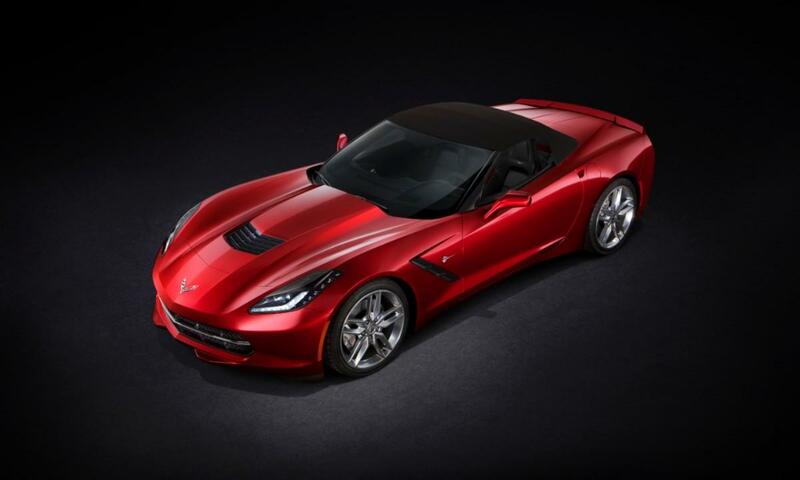 Chevrolet has announced pricing for the 2014 Corvette Stingray. The Stingray coupe will carry a base price of $51,995, and the convertible will start at $56,995. Both prices include a $995 destination charge. That price buys a 6.2-liter V8 with an estimated 450 horsepower and a seven-speed manual or six-speed automatic transmission, along with a bevy of tech features. The Stingray comes standard with two eight-inch configurable screens, along with Chevy’s MyLink infotainment system. With SiriusXM satellite radio, Bluetooth, and USB, SD, and auxiliary inputs, the nine-speaker Bose sound system will be able to play music from anywhere in the known universe. The 2014 Corvette Stingray is a major leap forward in both interior quality and tech, so buyers should be pleasantly surprised to learn that it won’t be much more expensive than a 2013 ‘Vette. A 2013 Corvette coupe starts at $49,600; a convertible costs $54,600. However, like a certain Porsche that we won’t name, options can add up quickly. Chevy says a fully-optioned 2014 Corvette Stingray coupe will cost $73,360. Want your brake calipers painted red? That’ll be $595. Most of the major options are contained in the 3LT ($8,005) and Z51 ($2,800) packages. The 3LT package features luxury and tech options like a navigation system, head up display, Napa leather on the (heated) seats and pretty much everywhere else, an HD radio receiver, and a one-year subscription to SiriusXM. Weekend racers will prefer the Z51 package, which includes: 19-inch front and 20-inch rear wheels, performance gear ratios, a transmission cooler, an electronic limited-slip differential, and bigger brake rotors with their own cooling ducts. Chevy says a Z51-equipped Stingray will do 0 to 60 mph in under four seconds and pull 1.0 g in corners. Magnetic Ride Control and Performance Traction Management is also available as a standalone ($1,795) option. This includes GM’s magic magneto-rheological dampers, which can adjust their stiffness almost instantaneously by sending an electric current through iron filings suspended in fluid. Performance Traction Management includes driver-selectable modes that tailor the system’s responses to certain road conditions. Pricy options aside, the 2014 Corvette Stingray is still an amazing value. Its V8 has 100 more horsepower than a Porsche 911 Carrera’s boxer-six, and the Porsche costs $84,300. A loaded Z51 Corvette coupe would still be cheaper, and would beat its 4.6-second 0 to 60 mph time. Would you pay a hair’s breadth under $52,000 for a Corvette? Tell us in the comments.